The landmark agreement, jointly announced here by President Obama and President Xi Jinping, includes new targets for carbon emissions reductions by the United States and a first-ever commitment by China to stop its emissions from growing by 2030. It was the signature achievement of an unexpectedly productive two days of meetings between the leaders. Mr. Obama and Mr. Xi also agreed to a military accord designed to avert clashes between Chinese and American planes and warships in the tense waters off the Chinese coast, as well as an understanding to cut tariffs for technology products. 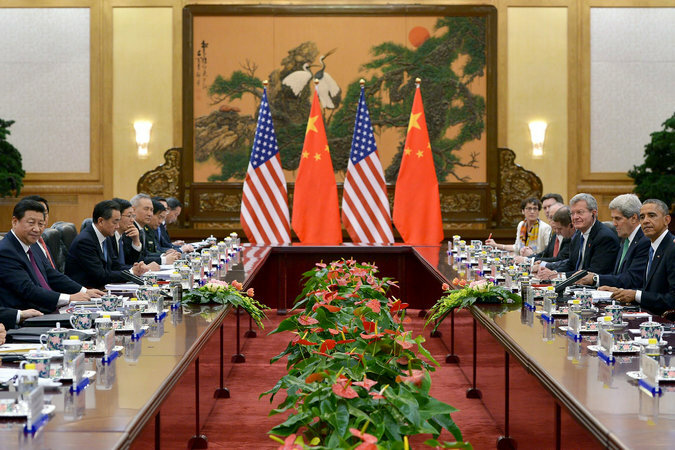 A climate deal between China and the United States, the world’s No. 1 and No. 2 carbon polluters, is viewed as essential to concluding a new global accord. Unless Beijing and Washington can resolve their differences, climate experts say, few other countries will agree to mandatory cuts in emissions, and any meaningful worldwide pact will be likely to founder. As part of the agreement, Mr. Obama announced that the United States would emit 26 percent to 28 percent less carbon in 2025 than it did in 2005. That is double the pace of reduction it targeted for the period from 2005 to 2020. China’s pledge to reach peak carbon emissions by 2030, if not sooner, is even more remarkable. To reach that goal, Mr. Xi pledged that so-called clean energy sources, like solar power and windmills, would account for 20 percent of China’s total energy production by 2030. Administration officials acknowledged that Mr. Obama could face opposition to his plans from a Republican-controlled Congress. While the agreement with China needs no congressional ratification, lawmakers could try to roll back Mr. Obama’s initiatives, undermining the United States’ ability to meet the new reduction targets. Still, Mr. Obama’s visit, which came days after a setback in the midterm elections, allowed him to reclaim some of the momentum he lost at home. As the campaign was turning against the Democrats last month, Mr. Obama quietly dispatched John Podesta, a senior adviser who oversees climate policy, to Beijing to try to finalize a deal. For all the talk of collaboration, the United States and China also displayed why they are still fierce rivals for global economic primacy, promoting competing free-trade blocs for the Asian region even as they reached climate and security deals. The maneuvering came during a conference of Pacific Rim economies held in Beijing that has showcased China’s growing dominance in Asia, but also the determination of the United States, riding a resurgent economy, to reclaim its historical role as a Pacific power. Adding to the historic nature of the visit, Mr. Obama and Mr. Xi were scheduled to give a joint news conference on Wednesday that will include questions from reporters — a rare concession by the Chinese leader to a visiting American president. But as the world witnessed this week, it is more complicated than that. Mr. Xi won approval Tuesday from the 21 countries of the Asia-Pacific Economic Cooperation forum to study the creation of a China-led free-trade zone that would be an alternative to Mr. Obama’s Trans-Pacific Partnership, a 12-nation trading bloc that excludes China. On Monday, Mr. Obama met with members of that group here and claimed progress in negotiating the partnership, a centerpiece of his strategic shift to Asia. Negotiations for the Trans-Pacific Partnership are much further along than those for the nascent Chinese plan, known as the Free Trade Area of Asia Pacific, and some analysts said the approval by the Pacific Rim nations of a two-year study was mainly a gesture to the Chinese hosts to give them something to announce at the meeting. For all the jockeying, the biggest trade headline was a breakthrough in negotiations with China to eliminate tariffs on information technology products, from video-game consoles and computer software to medical equipment and semiconductors. The understanding, American officials said, opens the door to expanding a World Trade Organization agreement on these products, assuming other countries can be persuaded to accept the same terms. With China on board, officials predicted a broader deal would be reached swiftly. “We’re going to take what’s been achieved here in Beijing back to Geneva to work with our W.T.O. partners,” said Michael B. Froman, the United States trade representative. “While we don’t take anything for granted, we’re hopeful that we’ll be able to work quickly” to conclude an expansion of the agreement, known as the Information Technology Agreement. On Wednesday morning, Mr. Xi formally welcomed Mr. Obama at a ceremony in the Great Hall of the People; they later toasted each other at a state banquet. Administration officials said Mr. Obama had pressed Mr. Xi to resume a United States-China working group on cybersecurity issues, which abruptly stopped its discussions after the United States charged several Chinese military officers with hacking. Talks with China over expanding the 1997 accord on information technology broke down last year over the scope of the products covered by the agreement. But after intensive negotiations leading up to Mr. Obama’s visit, Mr. Froman said, the Americans and the Chinese agreed Monday evening to eliminate more than 200 categories of tariffs. While the United States still exports many high-technology goods, China is the world’s dominant exporter of electronics and has much to gain from an elimination of tariffs. Taiwan, South Korea and Japan increasingly find themselves supplying China’s huge electronics industry, deepening their dependence on decisions made in Beijing. The administration estimated that expanding the Information Technology Agreement would create up to 60,000 jobs in the United States by eliminating tariffs on goods that generate $1 trillion in sales a year. About $100 billion of those products are American-made. The administration faces a longer path on the Trans-Pacific Partnership, including whether Mr. Obama will obtain fast-track trade authority from Congress. That could make it easier for the United States to extract concessions from other countries, since they would have more confidence that the treaty would be ratified by Congress. While Mr. Froman conceded that sticking points remained, he said, “It’s become clearer and clearer what the landing zones are.” He said that Mr. Obama would seek fast-track authority, but that the best way for him to win congressional passage of the Trans-Pacific Partnership would be to negotiate the best deal. Keith Bradsher and Chris Buckley contributed reporting from Hong Kong, and Coral Davenport from Washington. A version of this article appears in print on November 12, 2014, on page A1 of the New York edition with the headline: U.S. and China Reach Agreement on Climate After Months of Talks.